As temperatures drop and parents start breaking out their best “Don’t forget your coat” voices, it’s worth taking stock of your interior décor to see if some refreshing is in order. We reached out to some design experts to get their best tips on decorating for fall without being tacky. 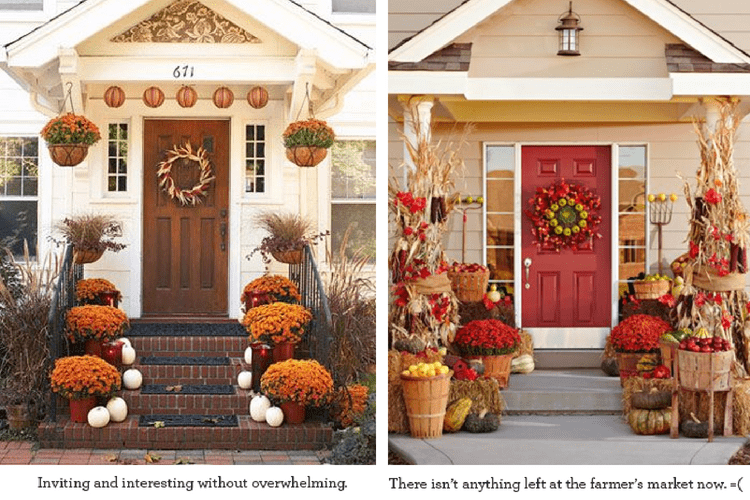 Here is the definitive guide to fall decorating. The most obvious changes will be visual in nature so start your planning by thinking through what you’ll need to add, room by room. Interior Designer Marina Umali points out that transitioning to fall décor isn’t just about adding, but taking away: “An easy way to start the transformation is to remove any summer-specific pieces.” A good rule of thumb is to sub something out for every item you intend on adding. Quick, name a color that makes you think of fall! If you’re like the majority of people – the first thing you thought of was orange. That’s all well and good, orange is one of the only fall hues that feels bright and lively, and its association with the season is longstanding. However, as Anna Brockway co-founder of Chairish reminds us, “orange is a little on the cliché side, so if you’re looking for a more subtle take on fall interior design try adding olive, plum, and earthy browns.” We’ll also add navy, mustard, and brick to that list to help you stand out from the crowd. In keeping with the adding while subtracting tactic, be sure to sub out summer tones, especially pastels. The Pantone Institute has announced their choices for the official colors of fall, so head there if you’re looking for more color inspiration. We loved the advice from Iris Wingfield at Flat Pack Mates in the UK, “You want people to feel welcome from the moment they approach your house so consider a fall wreath with leaves, pinecones, and berries for the front door. Add a rug or doormat to remove dirt and water to keep the entryway tidy.” If you do hang a wreath, we recommend opting for an understated doormat outside to avoid being overly thematic. Make sure to show some restraint so that your porch or stoop doesn’t look like you bought out the Hobby Lobby clearance aisle the day after Halloween. A quick upgrade of your soaps and hand towels should do the trick for bathrooms. If you’d like to go the extra mile – consider Wingfield’s Mason jar suggestion or place a decorative bowl of acorns or chestnuts in an appropriate spot. We also recommend some sort of fall scent, to be covered in detail below. Apple/Apple Cider, Cinnamon, nutmeg, spices, wood (pine, rosewood, oak), pumpkin…the list goes on. If you want a 100% natural aroma boost, Wingfield recommends boiling cinnamon sticks, cloves, and nutmeg in an open pot to diffuse the scents throughout your home. Sights and smells are the easiest targets, but to really make the transformation complete look to swap out some textures. Summer fabrics are light and airy, which is perfect for high temperatures, but as fall approaches you’ll want something cozier and inviting. Textures are the best way to update a living room or reading nook without making it look cluttered or overdone. Brockway recommends subbing out standard accent pillows for plush options that beg you to snuggle up while adding a luxurious throw blanket for good measure. Wingfield agreed and suggests going the extra mile with tonal slip covers if your furniture seems particularly out of season. The point of decorating for the season isn’t to avoid Pinterest-induced guilt, or generate envy from your friends – it’s to make your space as welcoming and relaxing as possible to you and your guests. Aligning with the season allows you to more fully appreciate the special things about fall: changing leaves, the approaching holidays, and a sense of return to normalcy for parents! None of these suggestions are rules, so you do you. Let us know in the comments if you’ve got other ideas about making your home an autumnal haven. The tip about boiling cinnamon sticks, nutmeg and cloves really brought me back to my childhood. My mom did this when I was a child and it produced such a lovely aromatic scent for fall. I will pay homage to my mother and use this nostalgic memory for my home this fall.